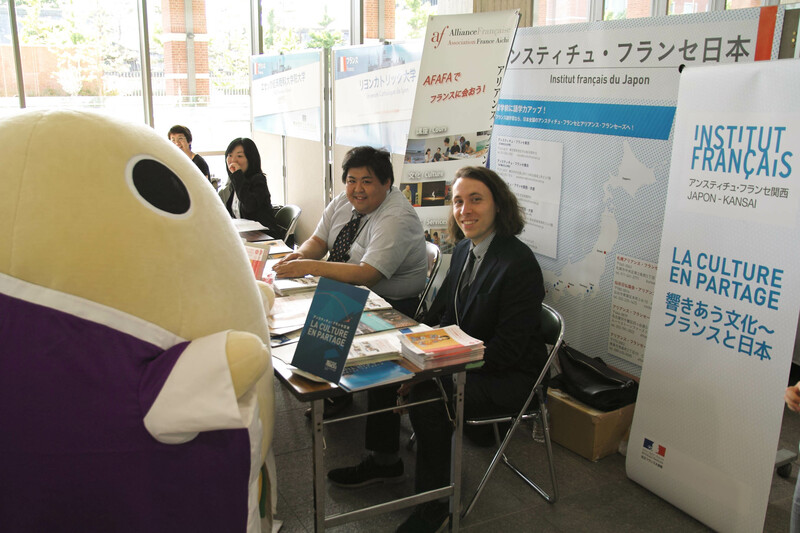 On May 18th, I participated in the Study and Research in Europe Fair, and I got to help at the booth of Campus France, a French government agency which encourages those in higher education to study abroad in France. 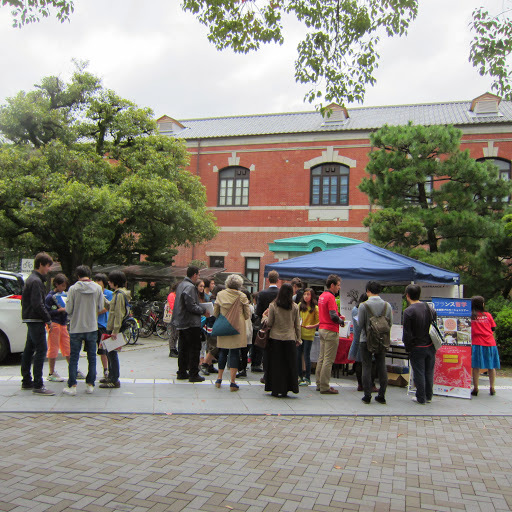 The fair was organized both in Tokyo and Kyoto and I helped with the Kyoto event. 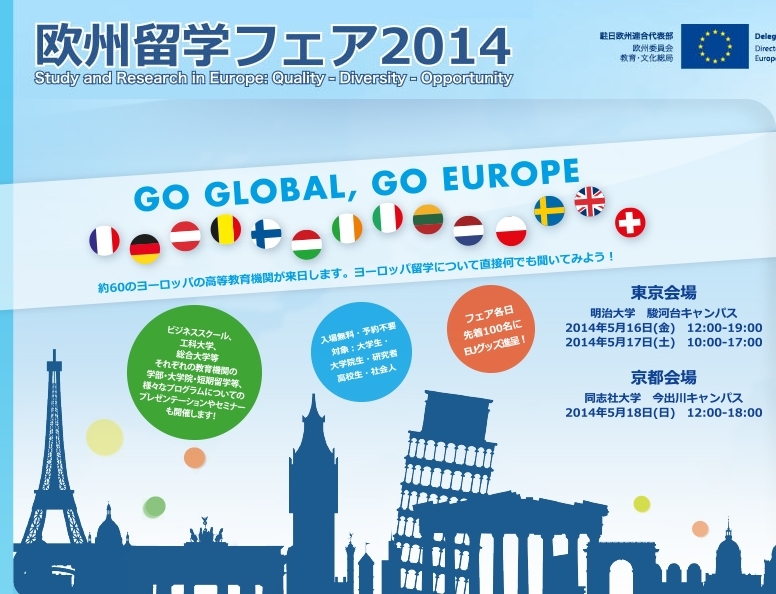 A lot of universities from all over Europe participated in the event. We had representatives from Austria, Belgium, France, Germany, Ireland, Italy, Lithuania, the Netherlands, Poland, Sweden, Switzerland and the UK. 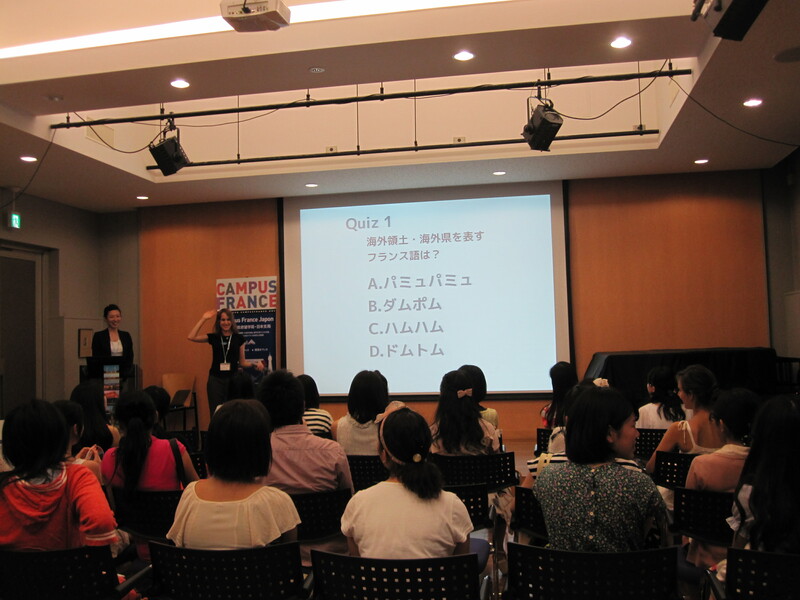 French universities and business schools were there too, catering to a broad range of students and specialties. Famous schools such as HEC or ESSEC for business and Sciences Po for political studies were present, and we got two universities coming from Lyon and Toulouse. The French higher education system is very different to the Japanese one, with the ranking of private business schools and universities being reversed, and with universities fees being very cheap compared to those in Japan for example. 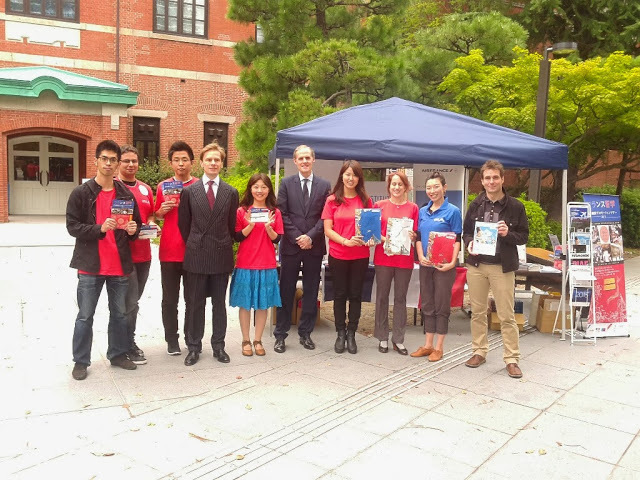 The Campus France booth was in charge of providing general information about scholarships, procedures before leaving, and French language schools and programs etc. 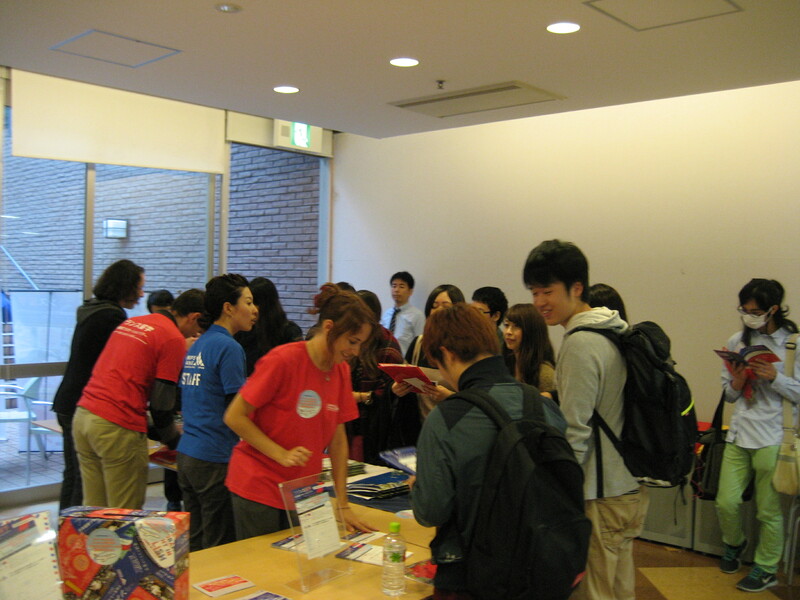 A lot of people seemed to be interested in studying in France because we sometimes had a queue of people waiting for counseling with the staff. In the afternoon we even got a visit from Mayumaro, Kyoto Prefecture’s official mascot, and he was immediately surrounded by rows of fan wanting a picture with him (me included). I’m sure he wants to go to France as well because I spotted him asking for information at the French Institute booth! 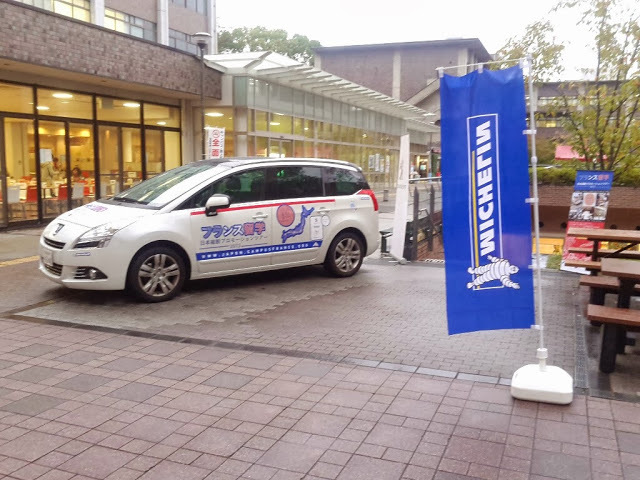 On that day, we had more than 600 people visit the fair and I got to interact with a wide range of Japanese students, all with different kind of projects and backgrounds but all with the same interest in France and its culture. 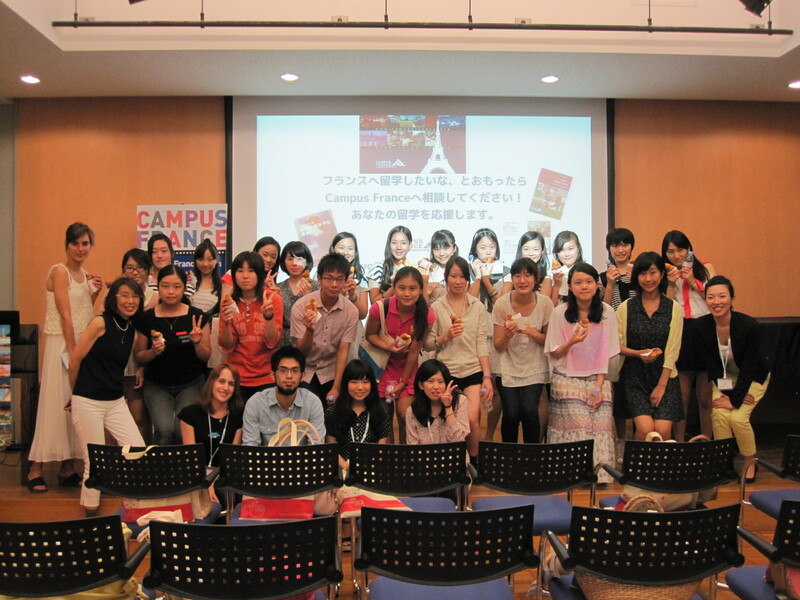 I was really glad to give an insight into French university life, and I hope they will be able to carry on their projects in France and become bridges between Japan and my home country too. Alice from KPIC here! I am writing from France where I am spending my summer holidays with my family after 2 years! I missed my family and friends! 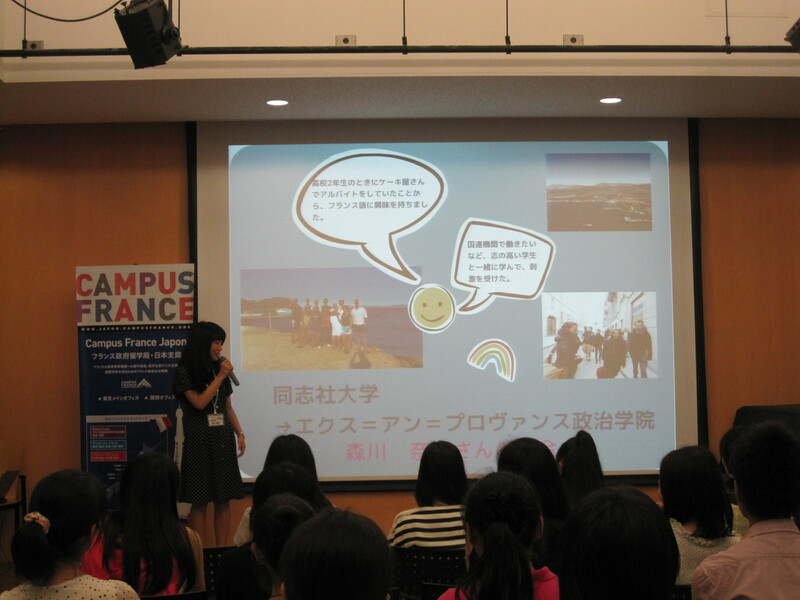 On July 25th, I participated in an event organized by the Kansai branch of Campus France for Japanese high school students. 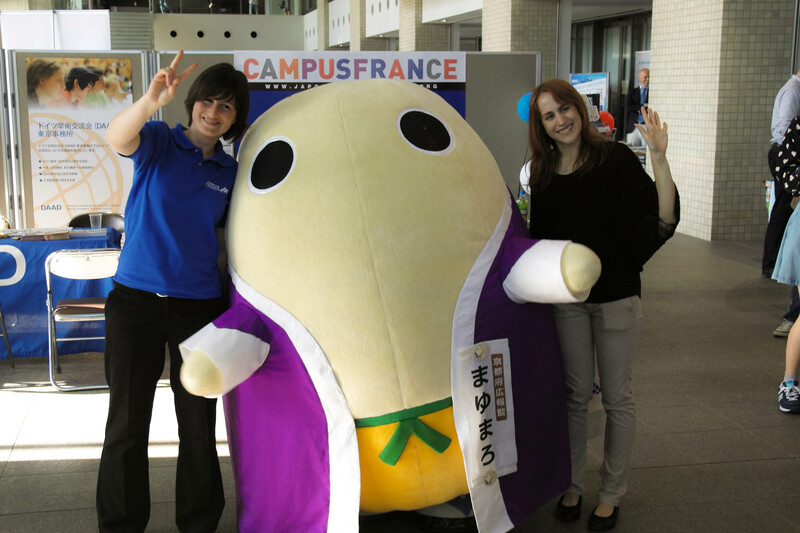 Campus France is a French government agency which encourages those in higher education to study abroad in France. They have offices all over the world, and two are located in Japan, one in Tokyo and one in Kyoto. 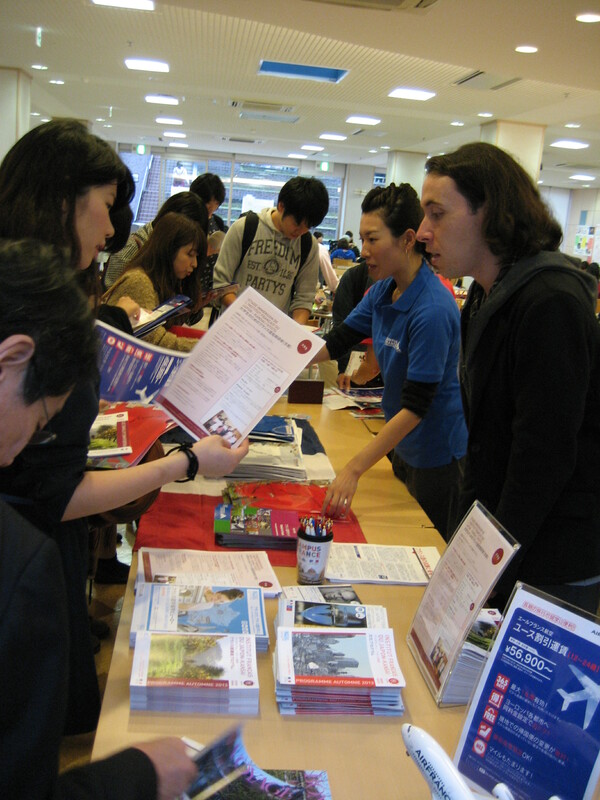 During this event, students visited various stands run by different countries, collecting stamps and listening to explanations about local life and study abroad. Five countries were represented: America, England, Australia, Canada and France, the only non English speaking country on the list. 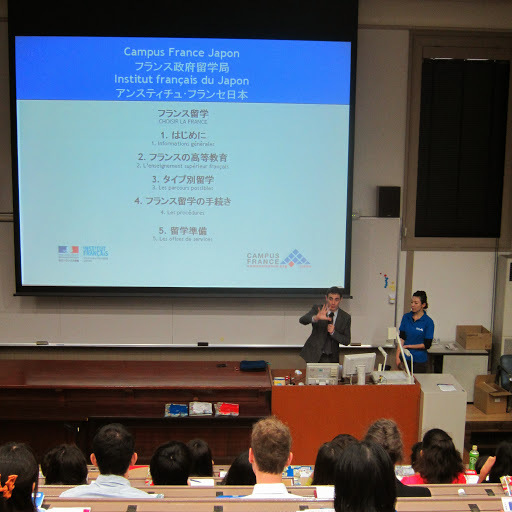 The French event was held at the French Institute in Kyoto, a French government organization in charge of promoting France and organizing various cultural events and language classes. 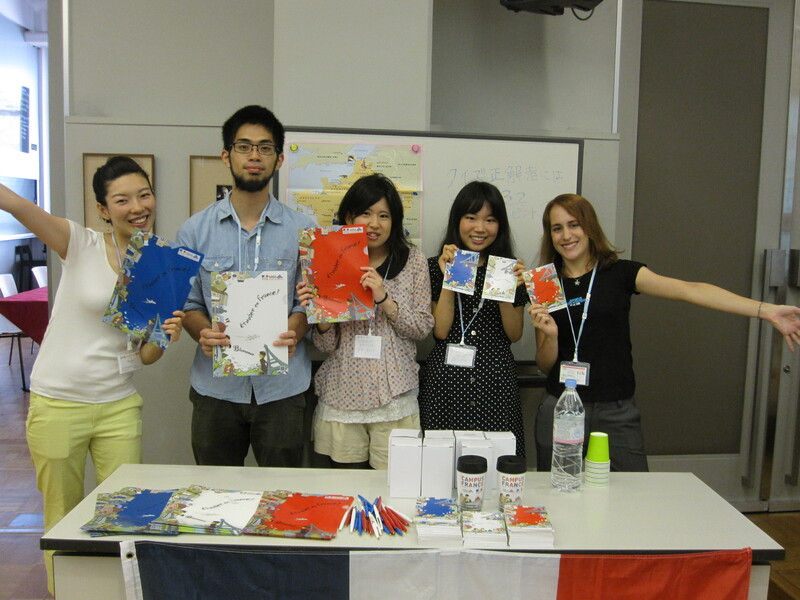 Around 130 high school students participated in the event, and 60 of them chose to visit the French booth. Together with the Campus France staff, I introduced France and its importance on the world stage. Indeed, France ranks first in agriculture within the European Union and is also the first country in the luxury industry worldwide. More than 250 million people in 32 countries on five continents speak French, and with French being one of the official languages of both UNO and UNESCO, speaking it is truly a strength in our increasingly globalized world. France also ranks first among the non-English speaking countries in the number of foreign students, 4th on the world level. 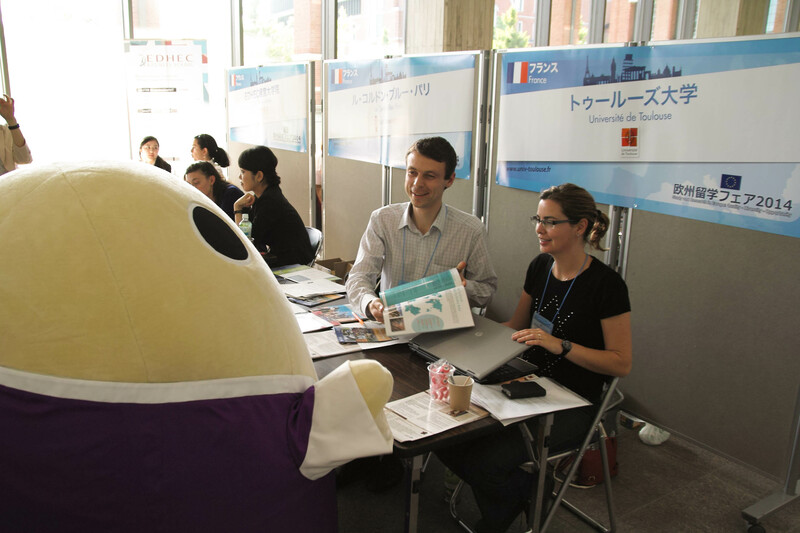 Moreover, with the recent visit of the French president Francois Hollande to Japan in June, it has become easier for Japanese students to get a visa and study in France. A great opportunity! 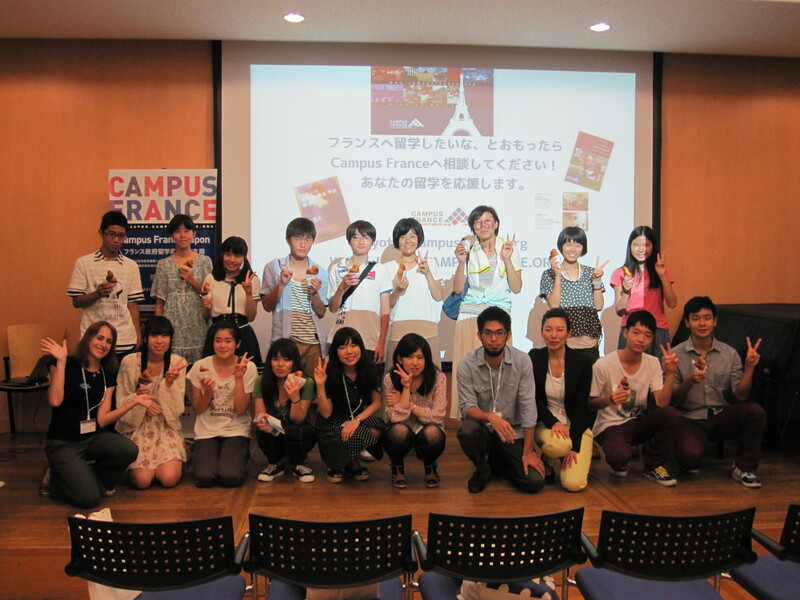 Three Japanese university students who had spent the previous year in France then talked about their experience, what was hard, what was rewarding, why they chose France, and how this experience has changed them. We also put quizzes in the presentation so high school students could win some goods, and at the end we all ate croissants together and chatted about France, what they liked from there, their current studies, and their future plans. I was really glad to have this chance to promote my country to high school students, an audience with which I don’t have a lot of occasions to interact. I was touched by how much they loved France and really wanted to go there one day, and by their enthusiasm as well. It was really a rewarding experience to be able to help with this event, and I hope I will have other chances in the future to participate again and promote France as a wonderful study abroad opportunity!